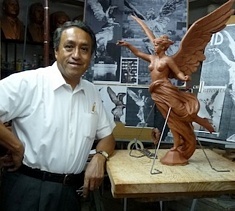 Victor Gutierrez Guerra was born in Mexico City on November 9, 1950 to a family of sculptors who have made important monuments in Mexico since the 19th century. He is a licensed architect from the Universidad Nacional Autonoma de Mexico, and studied various art techniques both at La Esmeralda and the Academia de San Carlos. He sculpts mainly in bronze, marble and stone while also being an accomplished painter and draughtsman. His production includes several monuments in Mexico and abroad, including Our Lady of the Angels in Dublin, Ireland. His work has been part of more than a hundred exhibitions in Ireland, France, the Netherlands, China, Puerto Rico, Colombia, El Salvador, Mexico and the US.